Black and White and Loved All Over: You're Not a Girl; You're a Town. You're Not a Girl; You're a Town. Once a week or so, I get nearly teary eyed, my chest tight with pride and contentment. And it's not because of Tessa, if that's what you're thinking. It's because of Nashville. Sailing along these streets, plodding through its parks, sitting at its coffee shops, chatting with its shop owners, I am hopelessly in love. Twenty-nine years into my relationship with this place, I've grown to love it in a way that's emotional, protective and proud, not unlike the way I love Tessa. It's where I've lived my whole life. As with all the best love affairs, I've weathered long periods of doubt, felt panicked and trapped. Time keeps passing, and I find myself thinking, God, I've maybe lived nearly half my life already, here in this town. I've had tough moments when I've felt forced to throw some of my dreams overboard completely; basically all the ones that involved getting the hell out of dodge and living somewhere hectic and smelly and buzzing all night. But I've come to realize lots of things about myself and my sweet-smelling town, most of all that where I live has almost nothing to do with how much I can accomplish in life or how happy I'll be or not be. And I've made sacrifices for love, as corny as that might sound, that I don't regret making. I wrote on the "About" page of this blog that living in the same city your whole life is like losing your virginity to your husband, in that it's virtuous and romantic but also pretty much a big bummer. (Hello! Big-time missing out!) For the record, I did live in Knoxville for six years—four years for college at UT and two years after that to work at Metro Pulse. After I was fired from that job (because I was young and stupid and thought life was supposed to be fair), I went home to our apartment and lay in Nekos's arms and cried my eyes out, stopping only when he suggested we pack our things and move (three hours away) to Nashville. He was waiting tables at a pizza place and was eager to get a fresh start in a place with an actual job market, plus he knew my mom and dad lived here. Now that he's here, I know I'll never convince him to leave. It's hard to believe he's not from here, the way he navigates Nashville's backroads (I ask him for directions constantly) and seems to be buddies with all its barflies. So here we are. We bought a house here, made our little girl here and have forged our friendships and careers here. Life could throw a curveball, but I think here is where we'll stay. Over time, my panicked feelings about living here all my life have been eased by travel, which has only strengthened my feelings about Nashville's own specific sweetnesses. From the window of an airplane, Nashville doesn't look like much of anything; in fact it looks downright depressing compared to the lights of New York City at night or the grandeur of the Grand Canyon at 30,000 feet. Not until you're inside this place does it really speak to you. Sometimes it even sings to you, being Music City after all. Speaking of New York, I spent my teenage years mooning over a map, putting a hopeful pin in the Big Apple, but that didn't pan out. It could have panned out, had I shrugged off Nekos and the love we felt for one another. But I wanted a partner most, more than any other far-flung dream I ever had. And he never wanted to live in New York; he wanted to stay in the South where he can eat meat-and-threes and watch SEC football and not get overshadowed by too much of everything. So here we'll stay. And, at least for today, I am really happy about that. If you live in Nashville, what are your favorite things about this place? Or, if not, what do you love about where you live? *The title of this post is from the Avett Brothers song "Smoke in Our Lights." Sigh. Suuuch a good song. i'm here in nashville too, and i've lived in the area my whole life. franklin until i graduated, then murfreesboro for college, and now i live in south east nashville (with my husband, who i love my virginity too). sometimes i feel like i'm limiting myself staying here, but thinking about leaving also makes me feel like i could never find a place that would feel like home the way nashville does. i couldn't live in a big city. too much going on. nashville has great food, great shops, great vintage shopping, and is just a short drive away from some of the most beautiful land in the country (as far as i'm concerned.) i love nashville. and i always will. I'm visiting Nashville for the first time on Sunday - for a week, to record my first album. Super excited - and also wondering what to pack?! Any pointers from a lover & resident of the city?? I'm from West Coast Canada so it's a wholllle new world. my family moved to brentwood almost three years ago from texas. i was already in college so i've haven't spent as much time there as i would like to. my favorite place to go is jeni's! their pistachio honey ice cream sandwich is amazing! (along with everything else there:) i can't wait to do more exploring when i live there this summer! i'm glad you you love where you live..that's a wonderful feeling! One of the nearish days, the mister and I WILL come to Nashville to take in the city and visit friends! I've only driven through in my youth. I must ask, what is meat and three? Like three-way chili? 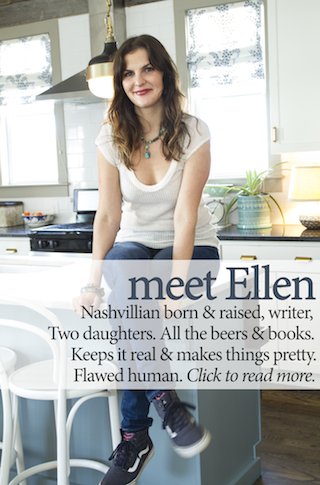 i also grew up in nashville and i just love that most of the time people are so nice and kind... the way it should be. i am amazed when people are rude. i also feel strangely at home in places where my family is from... i went to san remo, italy where my grandmother was born and felt so peaceful and happy there and the same with gulfport, ms where my parents grew up. for brianna: meat and three is a plate of food with a meat and three veggie side dishes like meatloaf, mashed potatoes, green beans and fried okra for example. What I love about Nashville is its skyline when I return from a trip. That means, "I'm home!" I also love that I reared (okay, raised) you here and that Nekos loves it. I also love that I live in the country, in a small town, just outside of Nashville. So that Tessa can visit her grandmother in the country! My magnet from the Loveless says it all, "I ain't bashful - I'm from Nashville!" I have a bad obsession with collecting anything with the Nashville skyline on it (*might* even have it tattooed...somewhere.) This town's given me my husband, my career, and many memorable (even if I can't remember them completely) nights and I can't see myself living anywhere else (of course the meat-n-threes and SEC football are strong selling points, too.) Where else can you bump into an old college buddy and Jack White in the same night? Love the post - gave me the good kind of chill bumps! 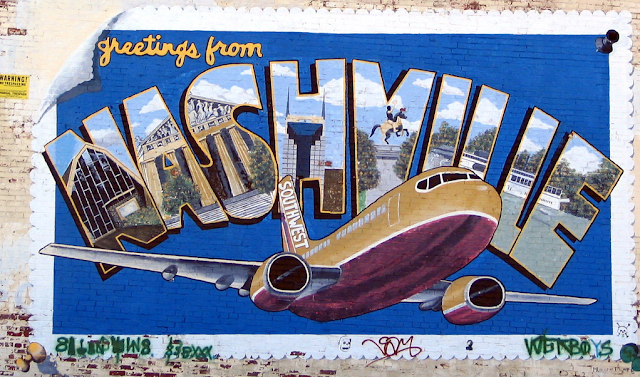 Butch Spyridon hired a marketing company to adequately describe Nashville. Three word emerged. I think these words describe your writing, my sweet.